North Carolina – The redistricting process in North Carolina has the makings of a classic thriller. There are twists, turns, politics, intrigue, and edge of your seat courtroom drama. Not to mention the crazy quilt of maps. Here is an overview of what has happened so far in this state’s district drawing saga. 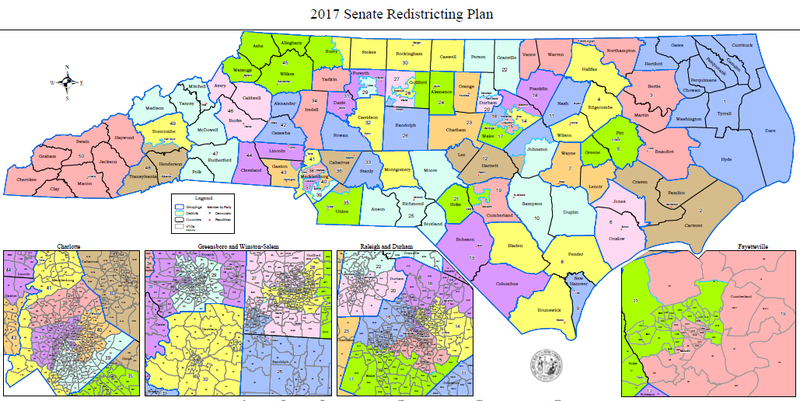 Legal challenges to the North Carolina legislature’s congressional map and its state legislative map for the state house and senate chambers have centered on gerrymandering claims. The congressional map was challenged initially, on the grounds that it was an unconstitutional racial gerrymander. The legislature’s hard fought new congressional map was adopted in special session in February of 2016, and subsequently taken to court, this time the charge would be partisan gerrymandering. Surprisingly, the court agreed, and declared the 2016 “post-racial gerrymander” map an unconstitutional gerrymander. Understandably weary, the North Carolina legislature appealed to the Supreme Court hoping for a stay from the federal court order to redraw its congressional map yet again. Perhaps the Supreme Court felt their pain (although I doubt it) as it granted that stay, effectively holding the case for further review, but temporarily delaying the need for yet another redraw. The house and senate maps were also found to be unconstitutional racial gerrymanders in August of 2016, which refers to a map drawn in a way that the primary or predominant consideration was that of race. The Supreme Court affirmed this decision and it was back to the drawing board for the North Carolina Legislature in August of 2017. The new 2017 map passed by the legislature was not a hit with the plaintiffs in the initial law suit or the court for that matter. A special master was appointed to modify the map, and just days ago, the court adopted that map as North Carolina’s official House and Senate districts until the legislature gets another crack at it just a few short years once new census numbers are released in 2021. Yes. In 3 years it’s deja vu all over again. A federal district court invalidates district 1 and 12 as an unconstitutional racial gerrymander in February of 2016. The Supreme Court affirms. Read the opinion. The legislature approves a new map later in February. See the map. The new map faces a partisan gerrymandering challenge in the summer of 2016. A federal district court finds at least 28 house and senate districts were racially gerrymandered in August of 2016. Read the opinion. Later in 2017, the district court rejects the 2016 maps, finding them defective, and orders a special master to draft revised maps. The special master delivers a revised map and report in December of 2017. Read the special master’s report. The court adopted the special master’s plan in January of 2018. Special master senate map. Several groups challenge the 2016 congressional map as a partisan gerrymander. A federal district court finds the 2016 congressional map to be partisan gerrymander and orders a redraw in January of 2018. Read the opinion. The legislatures appeals the decision to the Supreme Court. The Supreme Court grants the stay until it can hear oral arguement.